Landfill Of Lettuce: Why Were These Greens Tossed Before Their Time? : The Salt The bagged salad industry is growing quickly. Consumers love the convenience. But one unintended consequence is waste. We investigate why a truck full of edible bagged greens went to the landfill. 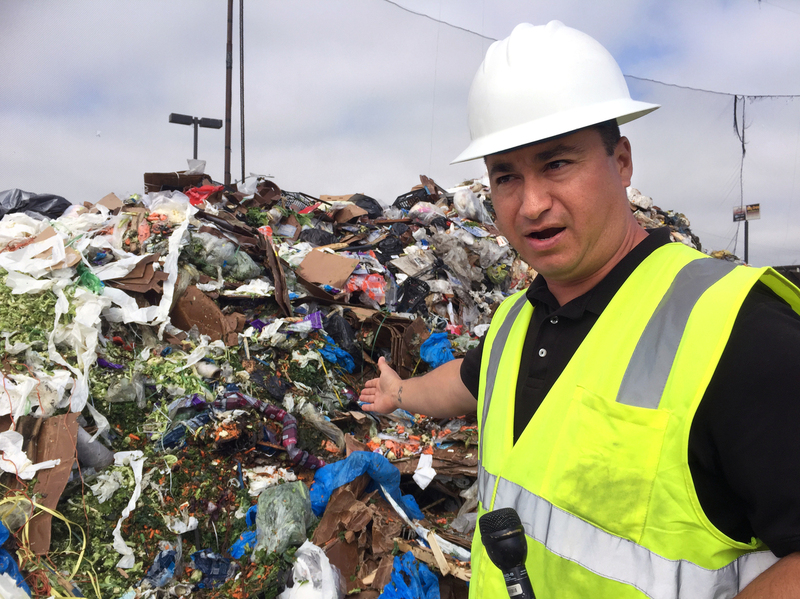 Cesar Zuniga, operations manager at the Salinas Valley municipal dump in California, points to salad greens that still have two weeks before their sell-by date. "Some loads ... look very fresh," Zuniga says. "We question, wow, why is this being tossed?" Here's a scenario lots of us can relate to: tossing a bag of lettuce because it sat too long in the back of the fridge. It doesn't take a long time for greens to turn to slime. Food is lost on farms, during processing and trucking. Supermarkets toss out unsold food. We were curious about this downstream waste — the part of the food supply chain that's largely hidden from consumers. In the Salinas Valley of California — known as America's salad bowl — we visited the municipal dump. 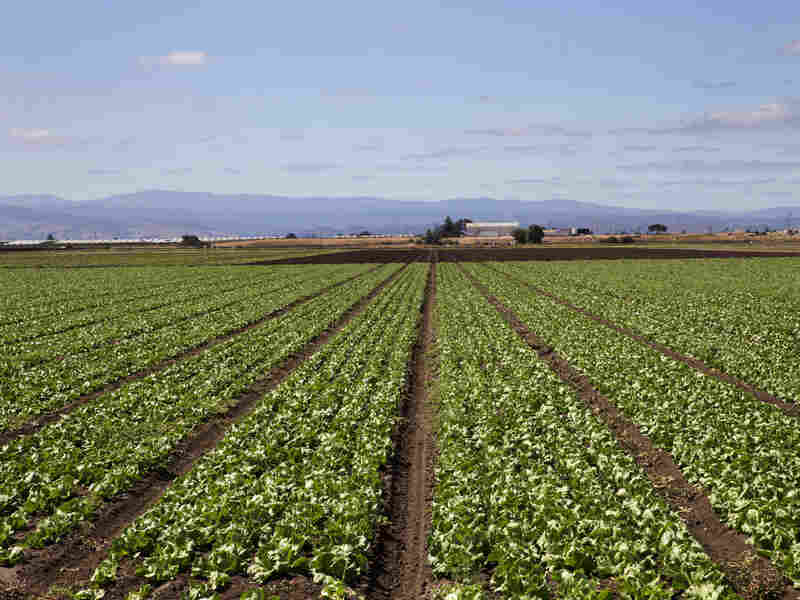 The fertile strip of land surrounding the town of Salinas produces an estimated 70 percent of U.S. salad greens. "This one looks like a mixed load," Zuniga says. As it tipped its load, out tumbled a 15-foot heap of greens. The Salinas Valley is known as America's salad bowl. The Natural Resources Defense Council estimates that farmers here and elsewhere around the country may over-plant by about 10 percent. "Some loads ... look very fresh," Zuniga says. "We question, wow, why is this being tossed?" Zuniga says the load that arrived on this day is pretty typical. "This is what we see through the spring and fall months: We see a lot of food waste from the salad processing plants," he says. As we step closer to the dumped load, Zuniga picks up a bag of salad and looks at the sell-by date stamped on the package. "What ended up here was good for [another] two weeks or so," Zuniga says. We called Taylor Farms, the brand name on the bags we saw at the dump. It's one of the big salad processors in the area. In an email, Mark Campion, president of Taylor Farms Retail, told us that the "primary reason" that salad gets disposed of is that it gets too close to its "code date" — what consumers think of as the sell-by date. "If we overrun a particular product ... it might not have enough code date for the customer to receive it," Campion said. The bags we saw at the dump still had almost two weeks before reaching the sell-by date. But that was probably not long enough to ship them and get them onto store shelves, because grocery chains need plenty of time to sell the products while they're still fresh. "Most [grocery store] customers require 10-11 days of useable code date upon arrival at their distribution center," explains Campion. Campion says Taylor Farms gives surplus product to its employees and donates some to food banks, too. "The last option is sending product to disposal," Campion wrote. "It's rare that product gets disposed of, but it does happen." There are no official estimates of waste from salad processors. And as the U.S. Department of Agriculture has noted, it's difficult to estimate food loss at the farm level not just for salad greens but for foods across the supply chain. The Natural Resources Defense Council has surveyed California farmers about waste. "It's a a difficult topic," says JoAnne Berkenkamp, a senior advocate for the environmental group's Food & Agriculture Program. "Farmers don't want to talk about something they've grown and weren't able to sell." It's a sensitive topic — especially in drought-stricken California — where farmers use a large quantity of the state's precious water. But Berkenkamp says the survey research shows that some farmers grow more than they can sell. "Most large growers have strong incentive to over-plant," explains Berkenkamp, because they "don't want to run out of product or come up short on a contract." The NRDC estimates growers may over-plant by about 10 percent. This may not sound like much, "but it can really add up to thousands of pounds of surplus product," Berkenkamp says. And here's another issue: When bags of lettuce and other produce end up in landfills, it contributes to climate change. As the food decomposes, "it will release methane — a very powerful greenhouse gas," explains Berkenkamp. And food waste in landfills is responsible for a significant portion of methane emissions. So, what steps can shoppers take to address this issue? They can compost the greens they don't eat instead of tossing them. If more produce were composted, it could help reduce methane emissions, according to NRDC. And, here's a novel idea: Maybe more of us should rethink our shopping habits — and only buy what we know we can eat. Back at the Salinas Valley dump, there's a separate pile for compost. But because of all the plastic in the lettuce waste from the salad processors, it can't be composted. Tune in Tuesday night (June 16) to the PBS NewsHour and check The Salt on Wednesday for more on food waste in the Salinas Valley. Here's a sneak peak of the upcoming story.